Here’s a great recipe that will prepare in under 30 minutes. Though you will need to marinate your chicken first for 30 minutes to one hour depending on your intensity for citrus flavors. But once the meat is marinated, as I mention the rest takes under 30 minutes to prepare. I found a great marinade recipe at She Knows Food & Recipes: Baja Citrus Marinade. The recipe calls for a Mexican beer, but I left that out. The following includes the beer if you wish to prepare the marinade with it. Place all of the ingredients into a blender and process the mixture until combined. Pour the marinade over the meat of your choice, cover and place in the refrigerator for at least 2 hours prior to cooking ( I marinated the meat for 1 hour). You could also opt to replace the orange juice and zest with lime or lemon. I also replaced the canola oil (which is a seed oil and is the cause of inflammation in the body) with avocado oil. Also this is one of my recipes I call –Salads as a Main Meal– as it contains meat. 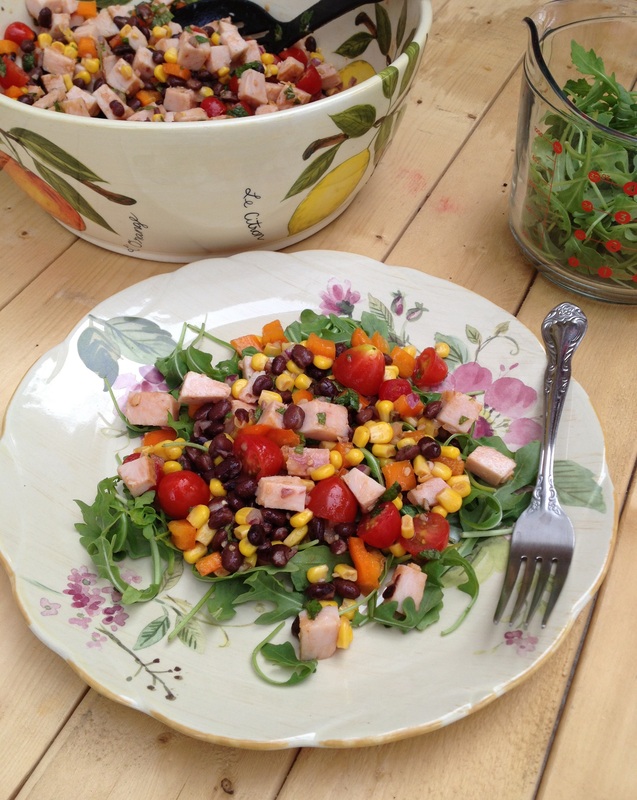 The recipe I use is one I have -Smoked Turkey Black Bean Bell Pepper and Corn Salad-. I had some chicken breast I used in place of the turkey and I didn’t use the Mint dressing that goes with the smoked turkey salad, as I thought it would clash with the citrus marinaded flavored meat. I just mix a little balsamic vinegar and avocado oil, with Himalaya salt (contains all trace minerals found in the salt mines) and black pepper. 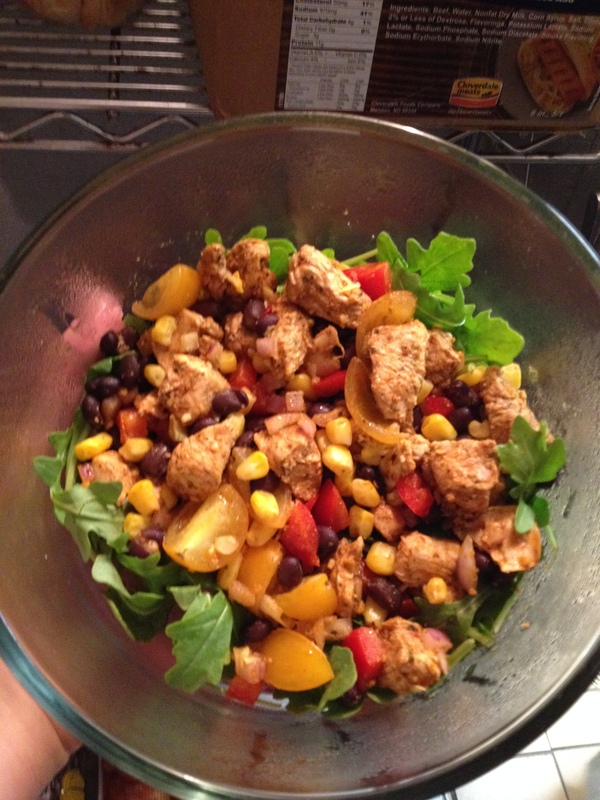 The following is what you will need to prepare -Baja Citrus Chicken Bowl-. By the way I say Bowl, because I prepared this recipe for the family dinner, but as I went off to work, I put mine in a bowl. Marinate chopped chicken for 30 minutes to 1 hour. Then cook in heated 350 degree oven for 30 minutes or until chicken is 165 degrees internal meat temperature. In the bottom of a large salad bowl add add desired amounts of olive or avocado oil, balsamic vinegar, and salt and pepper to taste. Next add chicken, beans, corn, tomatoes, bell peppers, onion, and mix well with wet ingredients. Place one to two hand fulls of arugula greens on a large salad plate and top with the meat mixture. Sever and enjoy!! This entry was posted in Chicken, Salads as a Main Course and tagged 30 minutes, Avocado oil, Baja Citrus Chicken, Baja Citrus Marinade, Barbecue chicken, Black Bean, Canola, Cook, Himalaya, Home, Marination, Muffin, Ranch dressing, Salad, Vinegar, Zest (ingredient). Bookmark the permalink. Delicious, will be giving this a try! Thanks Natalie, I hope you enjoy it. Good one Randy! Love the recipe for the marinade! I hop your able to enjoy the recipe for yourself.